Those who know me well, know that I love all good food, but dessert is my absolute weakness. I love all kinds of sweets, candies, bakes and Indian sweets too. The thing is, I can bake some wicked stuff, but I've never attempted too many traditional Indian sweets at home. I usually just go to an Indian sweets shop and pick up stuff over there. In a way, thats a good thing because a lot of these divine treats are usually high on the sugar and ghee (clarified butter). Atleast that's the notion I have. I have made a few before like this slightly healthier version of Sheera, Gaajar ka Halwa and Gulab Jamuns which I'd made a long time ago before I'd started blogging (I should make those again). Today's treat is a slightly healthier one. 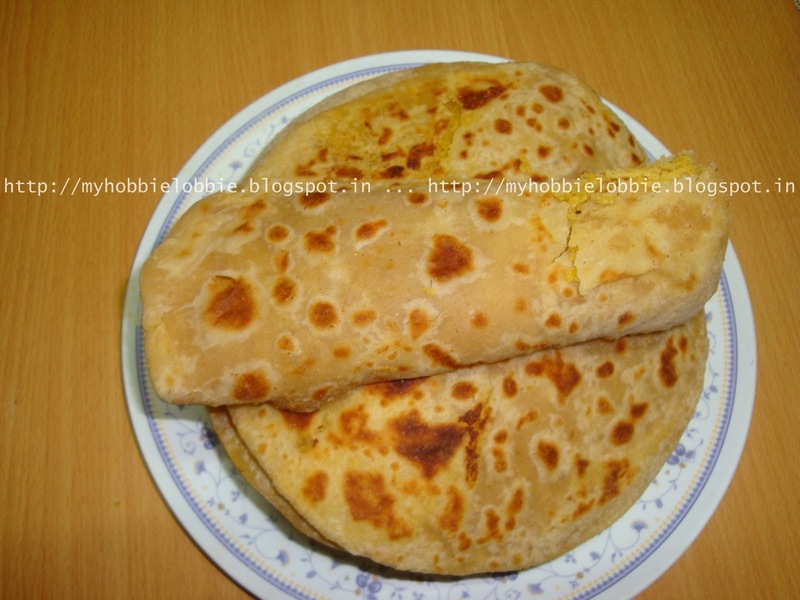 It is a sweet Indian flatbread called Puran (Poo-run) Polis (Poh-lees). These are usually made for the Holi and Gudi Padwa festivals. We enjoyed these for breakfast, had some with our afternoon cup of tea and enjoyed every bite of it. My husband loved it, for him these were perfect. That's always great to hear. Mix the flours and salt and knead it to a soft and smooth dough using milk as needed. Incorporate the oil into the dough by kneading in 1 spoon at a time. Knead well till all the oil is incorporated. Keep the dough aside in an airtight container for an hour. Wash the dal a couple of times and pressure cook it with a pinch of salt and 1 cup of water for 2 whistles. Turn off the heat and when the pressure has dropped completely, drain the excess water and spread the dal on a plate to cool off. Add the jaggery and cardamom seeds to the dal and mix well. I put it in the mixer and pulsed it a little till it turned to an almost smooth paste. If the paste is too wet, cook it off on medium heat till the moisture dries out a little, till it can be rolled into little balls. Cool it off, divide it into 10 equal portions and roll them into balls and keep aside. On a lightly floured surface, roll out the dough to about 4" in diameter (just approx large enough to contain the filling and a little extra around the edge for sealing), place the filling in the centre and cover with the dough, sealing it off (sort of like a stuffed dumpling). Flatten this ball out gently and ever so gently roll it out as thin as possible without exposing the filling. If it remains on the thicker side too, its no problem. From here on, you have to handle the flatbreads very gently or they will break. Place them on a hot griddle and let it cook on a medium flame till it lightly browns on one side. Flip over to achieve the same result. Smear a little ghee on top and flip over and let it cook till done. Smear a little ghee on the other side as well and flip over and cook off. I like to eat these a little warm. They refrigerate well too. Simply reheat them on the griddle and you're good to go. I love poli's !! You made them perfectly !! Delicious !! Puran poli looks delicious. Love it. Thank you, I hope you like it as much as we do!